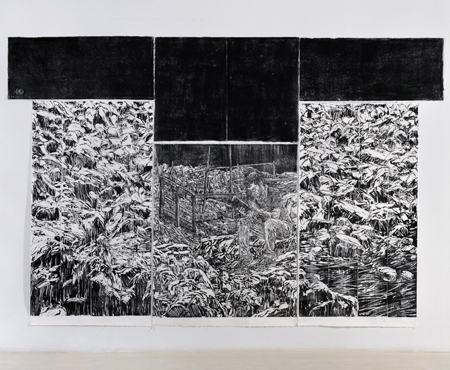 Orit Hofshi, ''Cessation,'' 2013, spoon printed woodcut on handmade paper, 118 x 78 4/5''. The land has a memory, and the land is a constant theme in the work of noted Israeli artist Orit Hofshi. Whether covered with forest, tumbled rock, or the crumbled structures of another era, her landscapes are laden with a melancholy history. Amidst the tree trunks and thickets of the triptych “Divergence” there are signs of human habitation – a bucket sits amidst hewn logs – but it feels abandoned to nature. “Effusion” is a print depicting a variation of the same scene, but the background is a tangle of grasses or swampy water that feels as though a storm has passed through. Although these scenes are romantic in a windswept way, they are also unsettled and unsettling. This show, titled "Cessation," is her first West Coast show featuring only large-scale work. While it is comprised of just six works, the show promises to be a powerhouse. Known as a printmaker, Hofshi tends to work large - "Divergence" is about 15 feet wide. She often puts together multiple sheets, sometimes even pairing prints with carved woodblock. The central panel of “Divergence” is carved wood, flanked by two prints on paper panels. The beauty and mystery of woodgrain is celebrated in her work. In Israel she uses inexpensive and readily available pine board to carve upon. When making prints, she inks the carved board and then uses the back of a spoon to burnish the image - a way of staying close to the material, and also of controlling the amount of ink that will transfer to the paper. In the process the swirl of grain and stamp of knots get transferred. Hofshi's carving is so detailed that from a distance the prints look like drawings, with a mood reminiscent of Veja Celmins. There is simply enormous dedication here, both to craft and to the creation of something deeply felt. The scale of her work lends itself to immersion, particularly the installation of “Convergence” in the gallery's project room. Visitors step onto a small porch and look into the darkened room at four prints suspended in space over a dark liquid. Two large prints of cascading rock will be suspended at an angle in the middle of the room, while two more will be hung vertically in the right corner. This places us within one of her dark, lugubrious landscapes. Like all obsessive work, these prints were no doubt meditations while being made, and they will become meditations for us when viewed.